Bad Cop/ Bad Cop is a band from San Pedro California. If you know anything, you know how important La Escalera Records is to punk rock on the west coast. That's why we're stoked to be a part of LE FEST 5 in San Diego and Tijuana, April 15-17. This is, by far, the most modestly-priced festival we've ever come across and it looks like a killer. Be ready for dancing, sweating, and some elite burritos! Get passes here before you can't anymore! Vans Warped Tour here we come! Taaadaaa! West Coast Tour with Leftover Crack and Starving Wolves start this Thurs! We're coming back. This time with Destiny Tourbooking. We'll be at Groezrock with just about everybody within 1000km (Europeans use the metric system. it's a fact.) AND a bunch of other places! Big thanks to Destiny, Ben Davis Touring, and Begizuria for the beautiful poster. Some call it a "mini tour"
With our bffs Decent Criminal and the stars of our Nightmare video: Homesick Abortions. Pretty sure we're gonna be tight bros with Atom Age by last call, too. Early show so you can do it up and get to work on Monday. So considerate. Apparently there's some kind of sportsball happening on February 7th. We'll be at Characters in Pomona with some cool dudes and ladies celebrating our independence from corporate athletics. We are beyond stoked to hit the road with SNUFF in February! They've got a new album, and it's the 20th anniversary of DEMMAMUSSABEBONK. Time to party. Check the Fat site for more details! DIY to the rescue! LA photographer and music journalist, Martin Wong has been single-handedly funding the music program at his daughter's public elementary school for 8 years now. 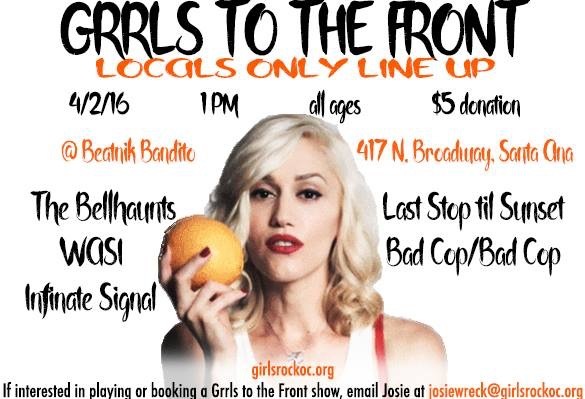 (she made this excellent flyer) These annual all-ages events feature bake sales, raffles, live performances from bands like The Adolescents, UPSET, Mike Watt and the Secondmen, and this year: Bad Cop/Bad Cop, The Crowd, Bombon, and FourEyedFour. Come out on Sunday, January 31 to Chinatown's historic Grand Star Jazz Club!